This is a bit random. My birthday was last May. The problem being, when Gran Oh Waily asked me what I would like for my birthday I hemmed and hawed for several months. It is mostly because I have hit that time in life where, frankly, I don’t need things anymore. 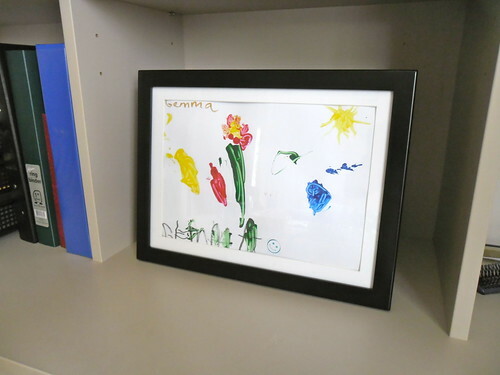 In the end, following a little bit of parental pressure, I admitted that I had been eyeing up a method of both displaying and storing my little Oh Wailys’ pieces of art. That was enough encouragement for Gran Oh Waily and off to the internet shopping she went. It arrived shortly before Christmas and since we were visiting then, I had an extra pseudo-Christmas present to enjoy opening. Enjoy it I have. It is a Li’l Davinci from dynamicFrames. It’s a very simple system to use and I can see that should I ever be rough with the internals that I have a chance of fixing it myself at home. It can hang both portrait and landscape and it comes with a very nifty little leg that allows it to behave like a photograph frame. We have it as a photograph frame at the moment as there are no suitable places to hang it in this particular house. Here it is in action. No more random images stuck to the fridge by magnets, taped to cupboards or resigned to a folio. 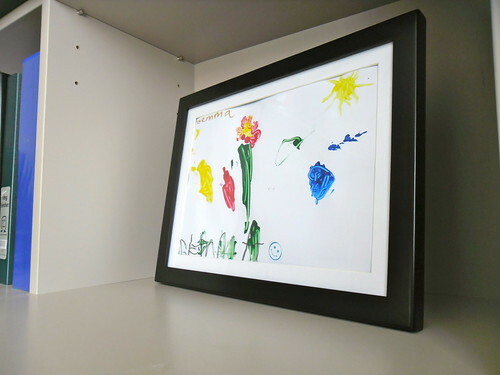 Now Miss Oh’s works of art get a display worthy of the creativity put in to them. I think another one of these is on the cards for Master Oh’s use, at least once he has graduated from random three stroke scribbles and in to “named” but not quite understandable images. What do you do with your children’s art? That’s a great way of displaying artwork! I generally take photos of said artwork, display it on my blog, then *ahem* bin it. Although, Nicola recently gave me this idea – http://makethinksew.com/2012/01/tutorial-gift-bags-using-a-book/ – which I think I’ll use from now on! I’m lucky (I think?) in that neither of my boys are particularly into artwork yet, nor are they overly fussed if it’s kept or not once it’s been finished.